From karate chops and thrown punches, the martial arts group that was with us stopped their frenzied activities and finally paused to enjoy the scenery. Night was slowly descending, aboard a medium-sized cruise boat, we watched from the topside as the sky, a fiery orange a moment ago, transformed into muted pastels. 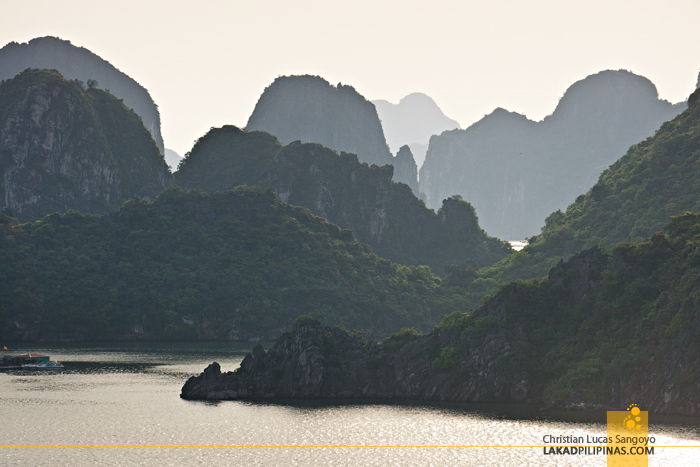 Halong Bay’s waters, reflecting the heavens, was absolutely golden. 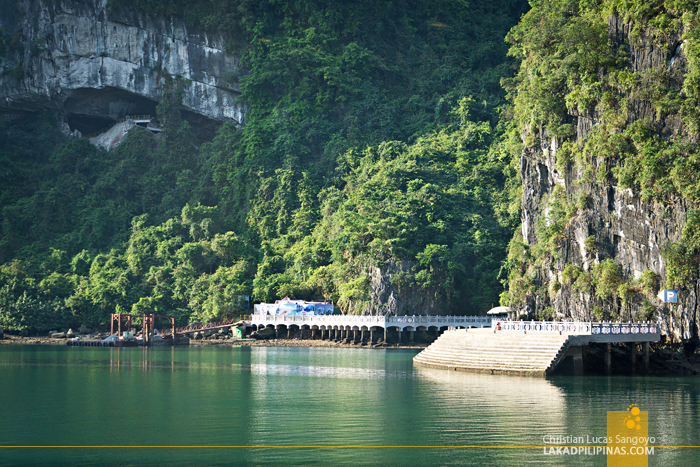 This was our first time in Halong Bay, but it wasn’t the first time we’ve booked a trip here. 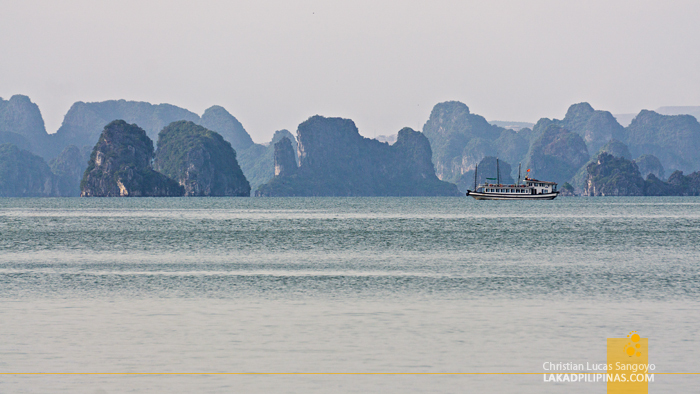 Almost a year back, during our first visit to Hanoi, we availed of Klook’s Halong Bay Daytour Cruise, but due to inclement weather we had to cancel. This time, we were sure we’d be going, and longer. 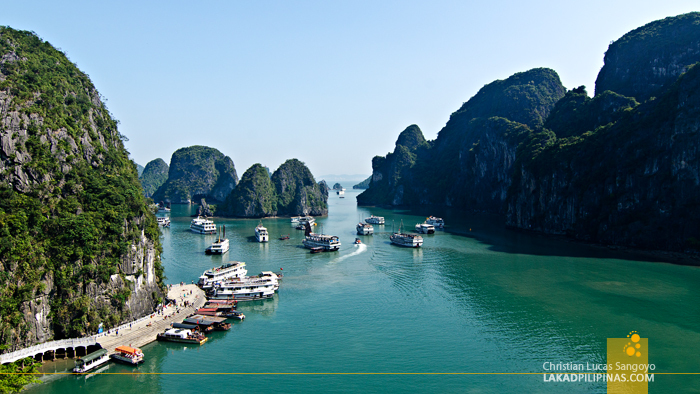 Booking our trip on the last leg of our Same Same Summer Trip, we again went to Klook for our Overnight Halong Bay Cruise. 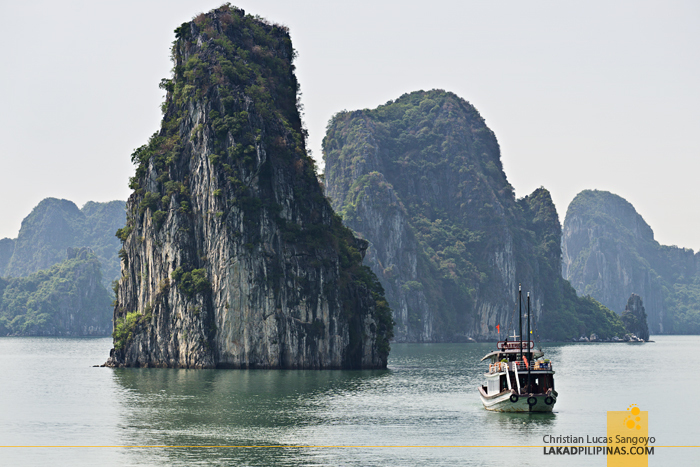 We could’ve gone with the local tour agencies in Hanoi, but it was far more convenient with Klook. Since we already have our details on the app, it took just a few taps and we’re good to go. We came straight from Sapa at the time, taking the train back to Hanoi, then waited at the lobby of Cocoon Inn Hanoi where we would eventually stay after the cruise. 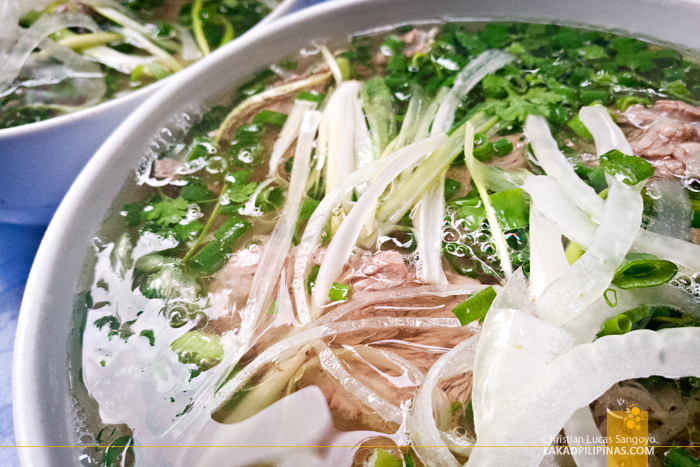 A quick breakfast of pho and bahn mi from the nearby stalls later and our tour van arrived. We showed our bookings from our phone, then we’re good to go! There were already a few people inside and we said our hi’s as we took to an empty aisle. Alex, our very knowledgeable tour guide then started our brief on what to expect. 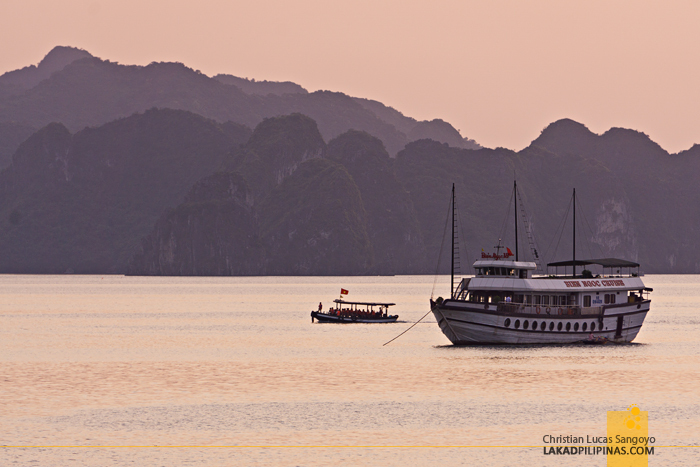 The ride from Hanoi to Halong Bay in the province of Quang Ninh took about three hours. 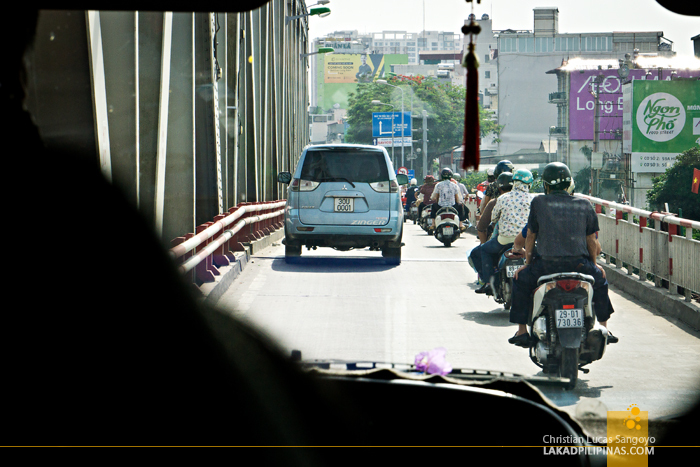 Freeing ourselves from Hanoi’s horrendous morning traffic, we arrived at the docks at Halong around noon time. We boarded our forty-meter wooden junk boat and were immediately herded to the dining hall—thank goodness, we were all famished. 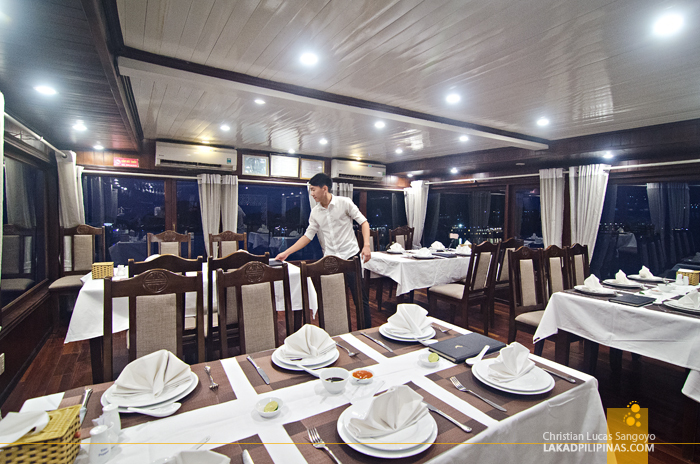 Our Halong Bay cruise was inclusive of four full meals—lunch upon arrival, dinner, breakfast the next day and lunch—besides the afternoon tea to be enjoyed at the topside during sunset. 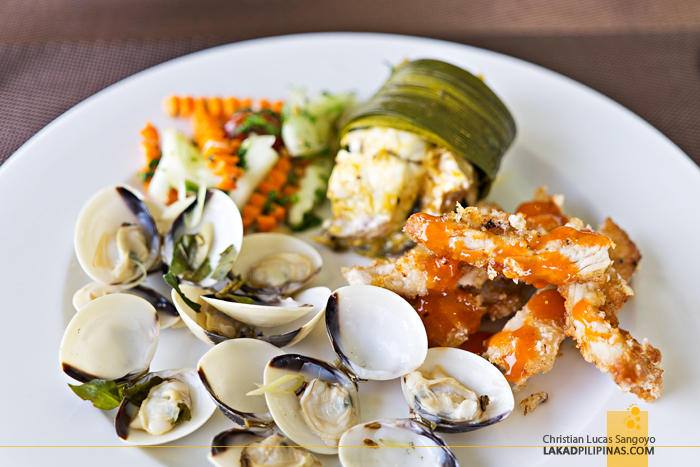 The offerings were no ordinary ones too, each one presented with style, but more importantly, they tasted delicious! Each table was good for four people and we got to share our every meal with a Taiwanese couple who we got to be friends with. 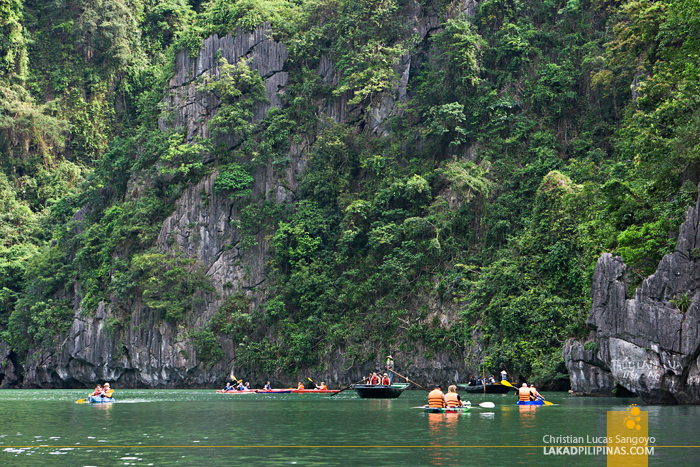 Our topics usually revolved around Taipei and the Philippines which they haven’t been to. Eventually, they even took our invitation to visit the Philippines some months later and we even met with them in Manila for a round of beer and videoke! 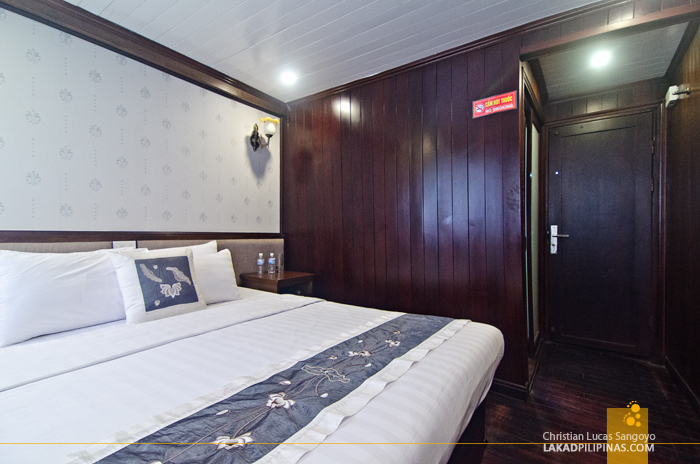 Our boat has a total of fourteen air-conditioned cabins on its two decks. Billeted on the lower deck, our room is finished in dark woods with a queen-sized bed at its center. 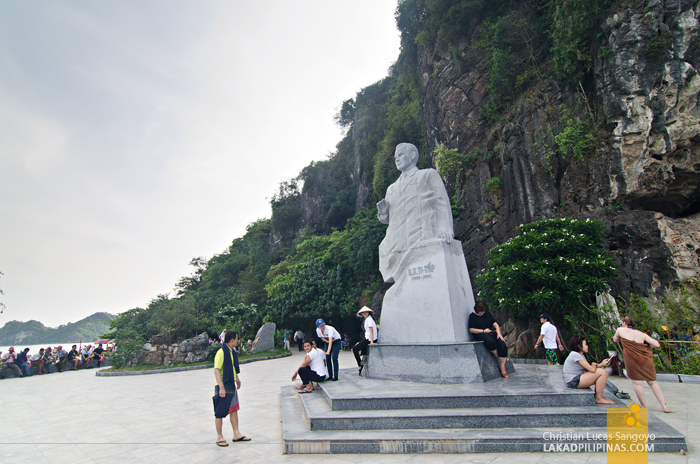 It has just enough space for walking around and a window overlooking the scenery of the bay. 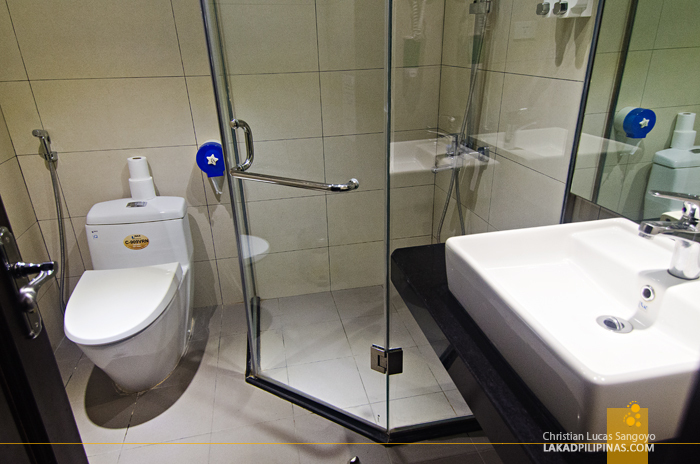 It also has an en suite toilet and bath with a shower and flushing water closet that actually works. We were surprised at how spacious it was. We were looking for a water heater for coffee and tea but found none. Apparently, they’re not allowed inside the boat—I guess, for fire precaution. A side table held two bottles of complimentary mineral water, not really enough for the duration of our stay in Halong Bay—and we forgot to bring some with us, we only brought beer, lol. But that was quickly remedied when I went out of the deck. A lady rowing a small wooden boat quickly went towards me, offering all sorts of snacks and refreshments. The price was double from convenience stores in Hanoi, but heck, the effort it takes to sell these right on the bay makes it worth it, and yes, it’s cheaper than if we buy on our boat itself, so I quickly took out some dongs and bought ourselves a few bottles of water and some crisps for our beer session that night. 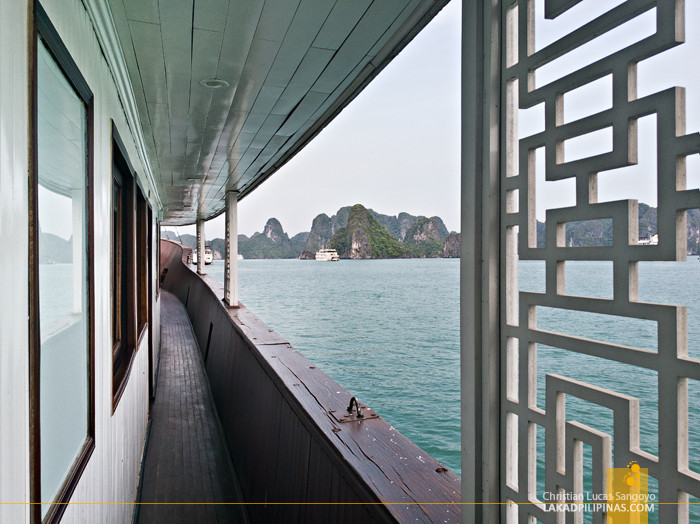 Besides lounging around the topside and enjoying the karts-dotted view of Halong Bay, the overnight cruise also offers tours and activities for guests. 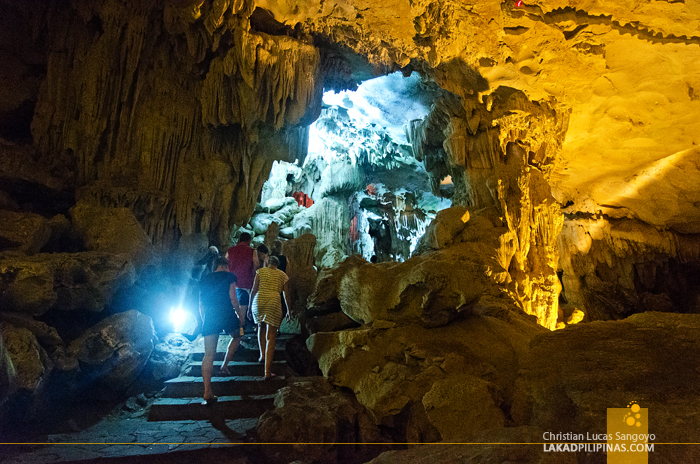 The first one, which we did later that afternoon, was a visit to the Luon Cave at Bo Hon Island. 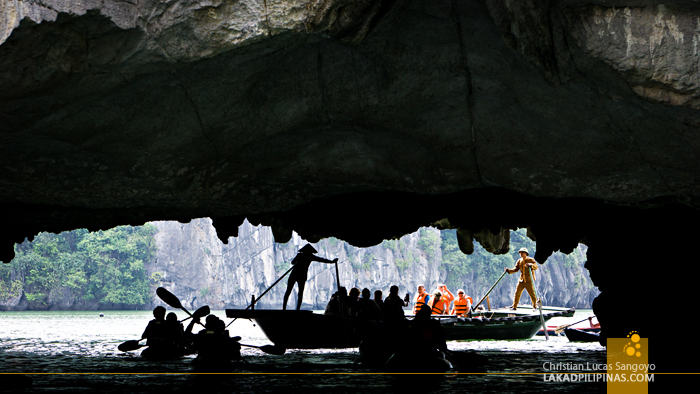 Taking a smaller boat, we were herded to a floating platform near a soaring rock face with a small cave entrance along the waters. 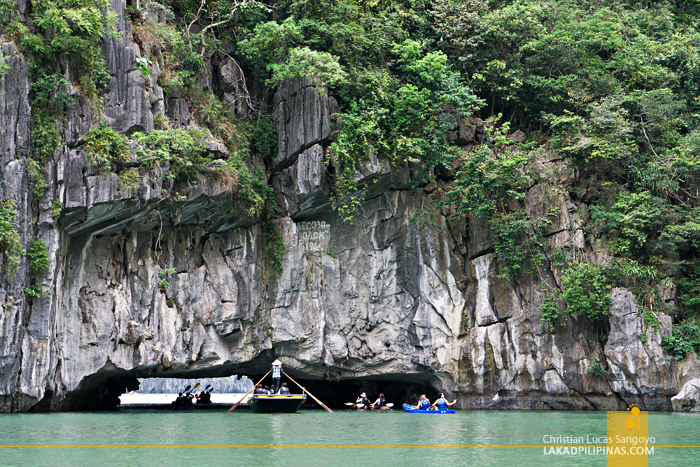 Luon Cave isn’t really a cave per se—well, it is technically a cave—but more like a portal to a secret lagoon surrounded by majestic karsts on all sides. 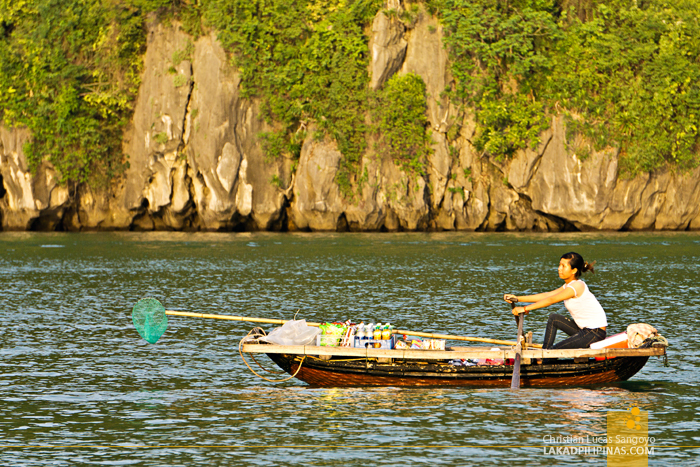 Guests have a choice of kayaking themselves to the lagoon or taking a small wooden vessel with a standing boatman in front—complete with non la hat—who would row for you. Guess what we took. The latter, of course. Our excuse, it would be extremely hard to take pictures with both hands busy with oars, plus, the chance of us turning over and wetting our gear is extremely high, especially with me on board. Lol. The ride took less than an hour, it was very picturesque inside the lagoon, even with the multitude of tourists dotting its waters. Our boat then proceeded to Ti Top Island, where a bust of a Russian hero silently greeted us, for some beach time. 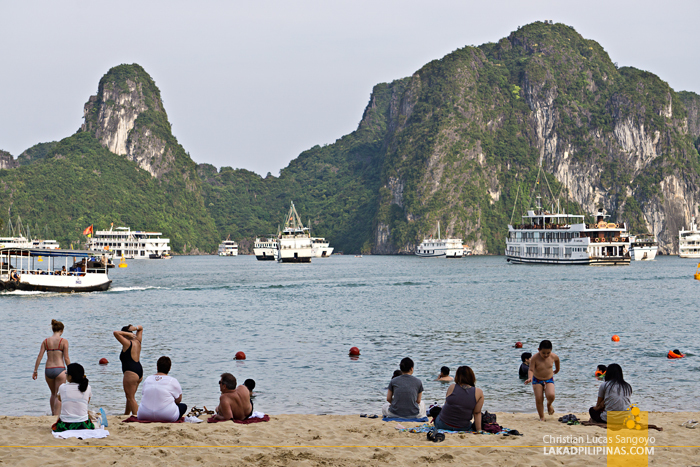 This was totally unexpected for I always thought we couldn’t swim on Halong Bay. I mean, the water is emerald in color, but it was definitely no Coron. 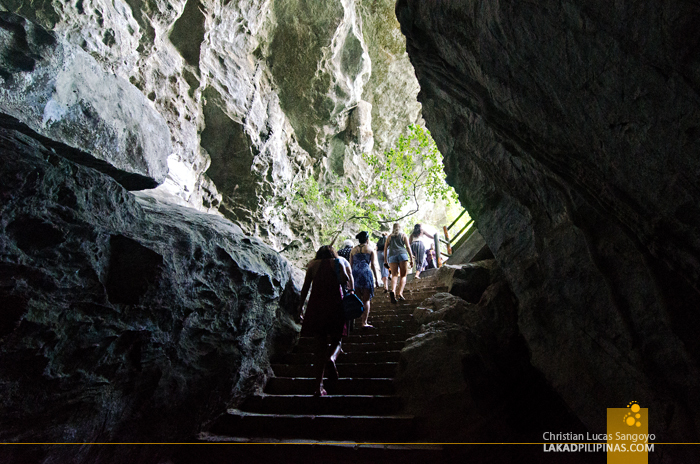 So, we passed off with the beach and proceeded on hiking the limestone karsts adjacent to it. Us, hiking? You better believe it. 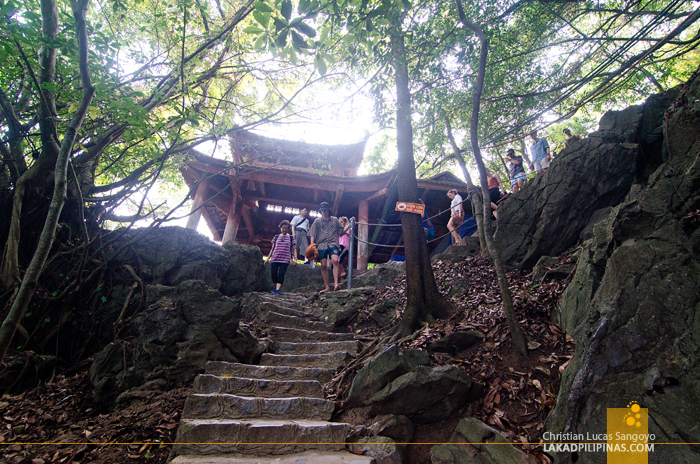 There were stone steps on the rock face, but still, we were panting our way to the top. It was pretty high. 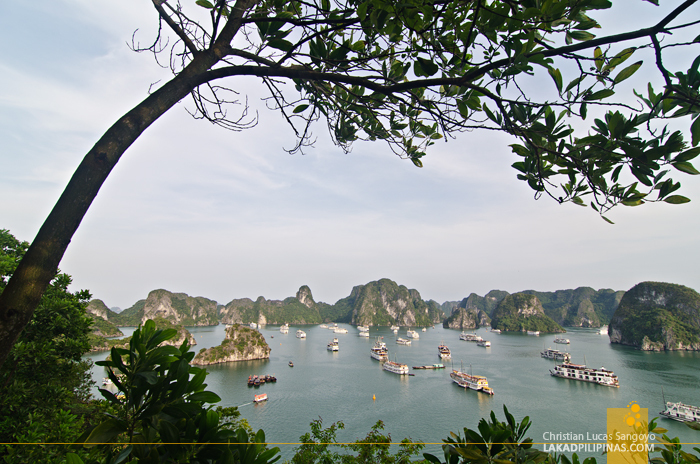 We reached the second viewpoint overlooking a scenic portion of Halong Bay surrounded by low limestone karsts before deciding that that’s it. We would not go further up! We were dying of thirst when I spied an unopened mineral water left by some tourist on the deck. I slowly inched towards it, only for it to be quickly snatched by a sweaty gal who just came up. Too slow, dude. Too slow, she seemed to be saying with her eyes. Then it was back on our junk boat for a relaxing afternoon tea while enjoying the sunset. Only thing was, we were booked with a group of martial arts peeps led by a certain Mr. Wang. Apparently, he’s a big deal when it comes to karate. 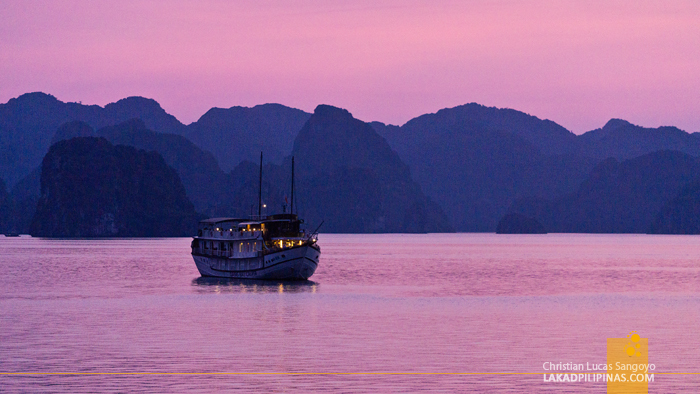 So, with the boat rocking and reeling from their routines, we watched the sun jiggle its way down across the waters of Halong Bay. 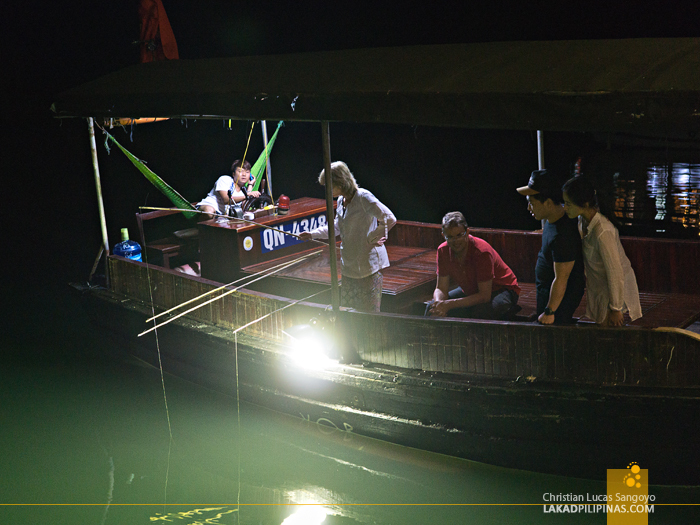 After dinner, a few of the guests went squid fishing on the small boat beside the junk. We watched them from the topside with cans of Bia Hanoi in hand. We caught a buzz, they didn’t catch anything. The next morning shone bright, we had a really restful sleep. Breakfast was a buffet of pho, bacons, eggs, and fruits; a weird combination, but it was really amazing. Sung Sot Cave was our destination for the day, a real cave this time. Dubbed as Suprising Cave, I was steeling myself to be mightily surprised with what’s inside. 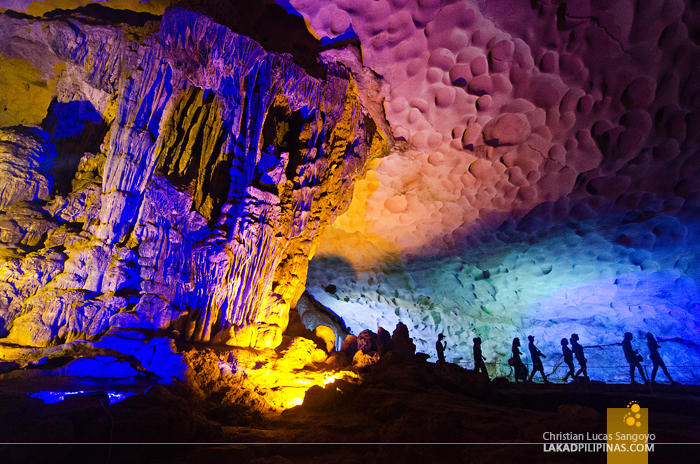 And indeed, as we entered its first chamber, a plethora of colorful lights greeted us. It wasn’t what I expected from this cave or any cave for that matter. 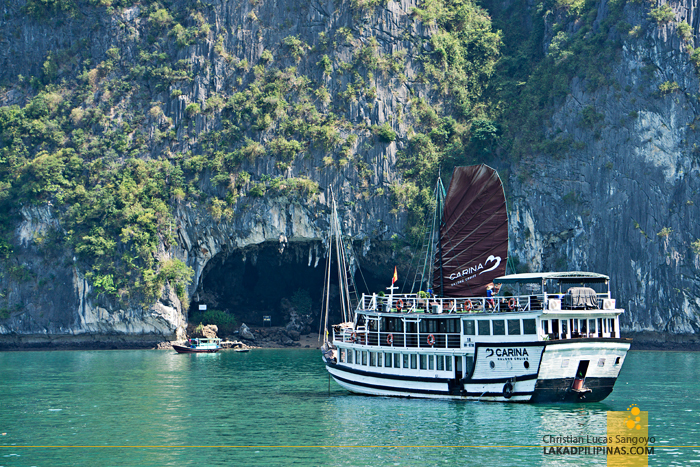 It is one of the hundreds of caves across Halong Bay and it’s really popular. The cave walls and ceilings are already dry, so I guess it’s already dead. To be fair, the lighting isn’t as gaudy as they are on photographs. In reality, it works really well, highlighting features of the cave that you couldn’t otherwise appreciate with a mere flashlight. 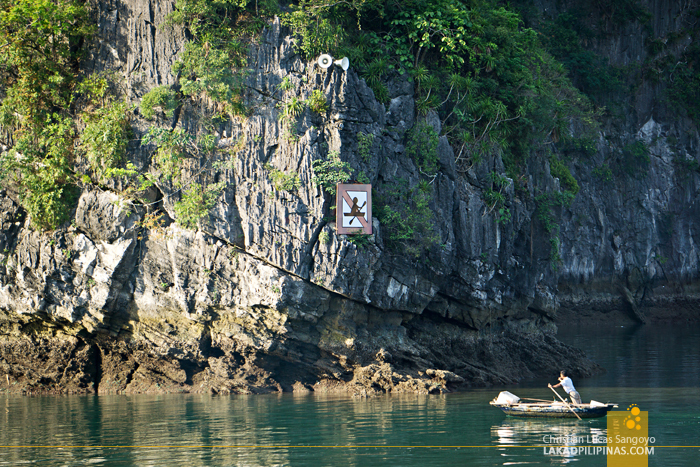 A viewpoint opens at the exit of the cave, which then led to a concrete stairway at the side of the karsts leading to a small port where our transfer boat waited. Lunch was cha gio which they call nem ran here. Vietnamese spring rolls are my favorite, I can eat these all day. 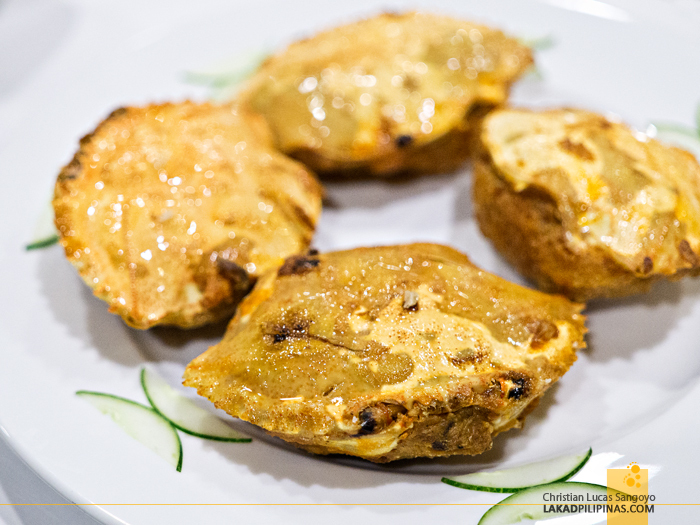 And this batch of cha gio was more special since we were the ones who made them! Yes, we had a mini cooking class aboard our boat before going back to port. 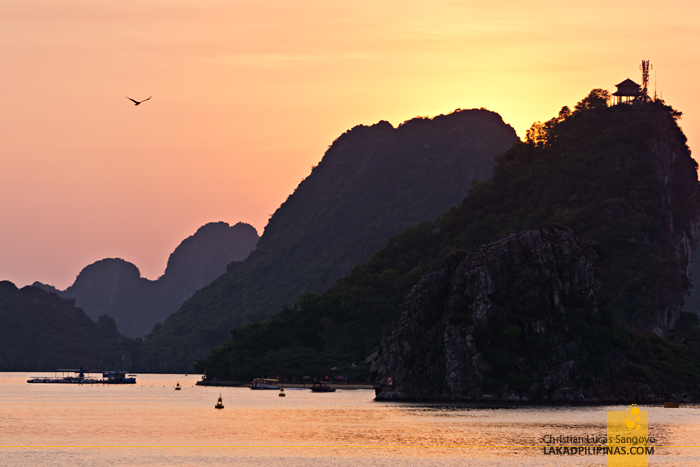 A filling way to end our Halong Bay cruise! ~ OUR CRUISE WAS MADE POSSIBLE WITH PARTNERSHIP WITH KLOOK. VIEWS & OPINION, ALL MINE.